FOR RVCC STUDENTS ONLY! Join activist, artist, and speaker Peggy Trotter Dammond Preacely in a private session right before the big event. Get to know a piece of history personally, ask questions, share experiences, and learn about the life of this incredible former Freedom Rider. Registration required. 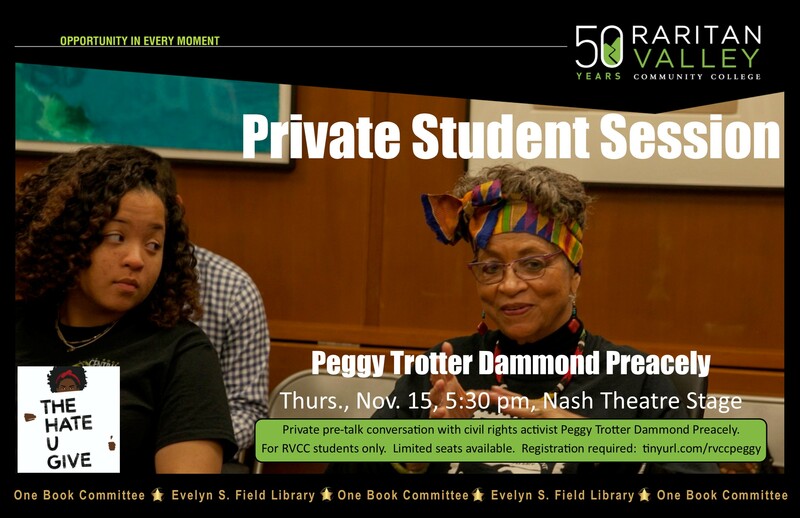 Acclaimed activist-artist and speaker, Peggy Trotter Dammond Preacely is a former Freedom Rider and working member of the historic Student Non-Violent Coordinating Committee (“SNCC”) that included among its founding members two civil rights legends—Rep. John Lewis, while a student protest leader in Nashville and the late Julian Bond, then a Morehouse College student—both of whom Peggy worked with during that history-changing time, along with other civil rights stalwarts. Beyond her own involvement in history-making events, Ms. Preacely is the descendant of a historic multi-faceted family tree. Among her ancestors are: Sally Heming’s sister, Mary Hemings Bell; famed abolitionists Ellen & William Craft, who escaped slavery by Mrs. Craft passing as the white male owner of Mr. Craft; and esteemed early civil rights activist, William Monroe Trotter, whose home is now a National Historic Landmark. Therefore, in addition to speaking about her experience as a SNCC member and Freedom Rider, Ms. Preacely conducts multi-media presentations on her historically-revered family. She further manifests her activism through art, performing her original poetry and spoken word inspired not only by her family’s background and her civil rights experience, but today’s youth that represent the future of this country and the world. Ms. Preacely also served as an advocate and administrator in the public health sector for over 30 years in various programs, both for government agencies and non-profits. She’s lived in the Los Angeles metro-area since 1982, and attends the renowned and politically-progressive Holman United Methodist Church—one of few churches in Los Angeles visited by Dr. King. Holman’s pastor emeritus is also civil disobedience/non-violence training icon, Rev. James Lawson—portrayed in the award-winning film, The Butler by another activist-artist, Jesse Williams of Grey’s Anatomy. In 2015, Rev. Lawson—whom Ms. Preacely also worked with in the ‘60s—presented her with the SCLC-SC’s Rosa Parks Humanitarian Award (the SCLC is the only national organization founded by Dr. King). On February 16, 2016 the accolades continued when Ms. Preacely and other extended family, attended a ceremony at Georgia’s prestigious Savannah College of Arts & Design (“SCAD”) to dedicate a permanent marker where her great-great grandparents, Ellen and William Craft boarded a train under their daring ruse. Ms. Preacely is available for speaking engagements, presentations and performances at the local, state, national and international levels for entities ranging from colleges to community organizations to conventions/conferences for associations/professional groups to churches to civil rights museum exhibitions.